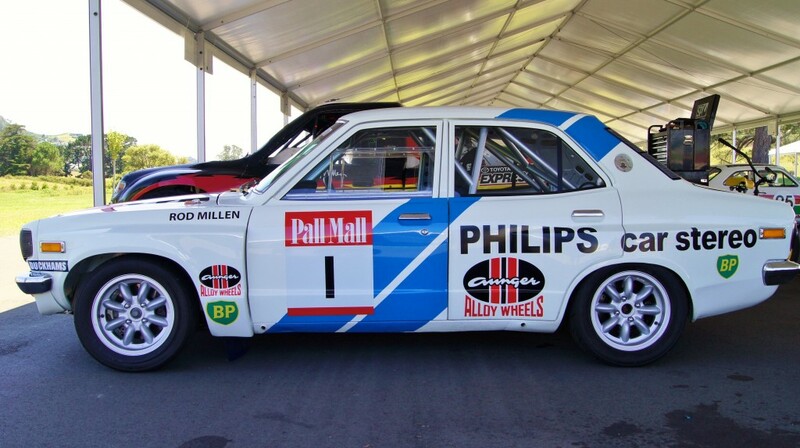 Rod Millen is a legend of NZ Motorsport. Pikes Peak Hill Climb winner, Asia Pacific Rally Champion, and the original NZ Rally Champion. Rod was the winner of the first National Rally title in 1975 driving a Mazda RX3 and proceeded to take hat-trick of titles in his Rotary powered machines in 75, 76 & 77. Over the weekend just gone, Rod hosted the Leadfoot Festival, a collection of stars and cars from all eras of motorsport. Rod set the fastest time of the weekend over the mile long seal hillclimb course in none other then his famous Pikes Peak winning Toyota Celica, thrilling the crowds with the shear power of the spectacular machine. But turning just as many heads was the car pictured above, an original liveried Mazda RX3 complete with Pall Mall Rally door banners which Millen was also driving over the weekend. This immaculately prepared RX3 was built by Rod’s brother in-law Peter Davidson, a name many rallyfans will recognise. The aggressive flared wheel arches and the sound of a screaming Rotary engine were a sight to behold for rallyfans, a real flashback to Millens title winning era of the late 70’s and those first three championships.